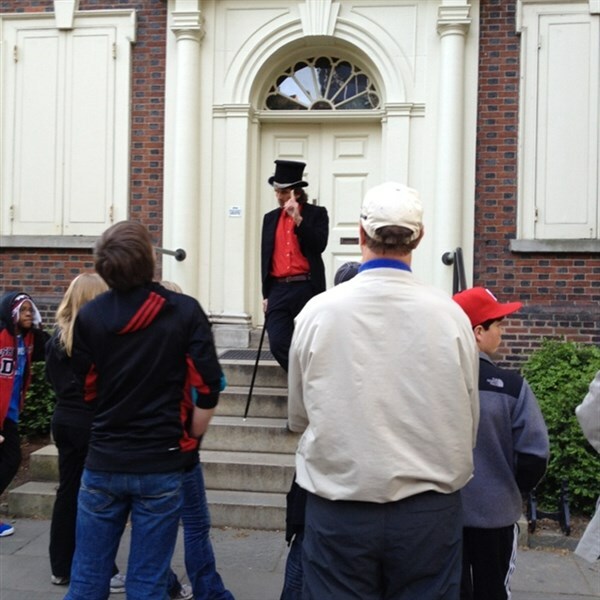 Perkiomen Tours visits haunted Philadelphia with Terror Behind the Walls and dinner for a true Halloween scare! Join us for a Haunted History walking tour, followed by dinner at the Hard Rock Cafe. After dinner we'll take you to Terror Behind The Walls at the Eastern State Penitentiary, for a night that is sure to give you a great big scare, and, remind you that it's Halloween. We will head to Philadelphia for a hauntingly good adventure and will begin with the chilling tales of America's most historic city. Peer into the darker side of Philadelphia's history and folklore where, at each stop, your guide weaves together colonial era stories, folklore, and haunting tales from the yellow fever epidemic of 1793 to the first bank robbery in America...from the burning bride to traitorous Benedict Arnold...from the ghost of Leah to the safety coffin and more. Next we'll head to the Hard Rock Cafe, next door to the Reading Terminal Market, for dinner. After dinner, we head for Terror Behind the Walls, at the Eastern State Penitentiary. The setting for Terror Behind the Walls is perfect for a haunted attraction. Eastern State Penitentiary was once the most famous and expensive prison in the world, but stands today in ruin, a lost world of crumbling cellblocks and empty guard towers. This gothic structure, with soaring 30-foot high fortress walls, is intimidating enough during the day. At night, the cellblocks fall into darkness, and the building becomes truly terrifying. Many people believe that Eastern State Penitentiary is haunted. As early as the 1940s, officers and inmates reported mysterious visions and eerie experiences in the ancient prison.